Celtic legend Kenny Dalglish believes Rangers' promotion will provide "a good kick-start for Scottish football". 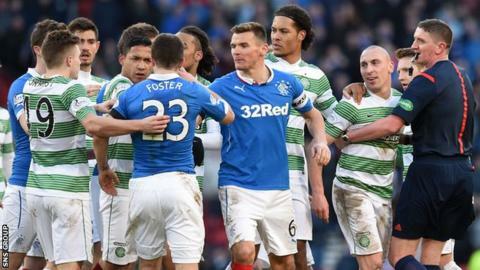 The Glasgow rivals meet on Sunday in a Scottish Cup semi-final, after Rangers won the Championship title last week. And Dalglish is glad the derby will feature regularly next season following Rangers' climb up the leagues. "Some people would get a lot of satisfaction from the demise of Rangers four years ago. But the football is not the same, is it?" he said. "It's fantastic that we've got an Old Firm match back on the calendar. "Next year there is going to be four, which I think for Scottish football and both Celtic and Rangers supporters is what it is all about." The teams met last season in the League Cup semi-finals, with Celtic prevailing comfortably. "The game last year was really a 2-0 drubbing for Rangers," said Dalglish, who played at Celtic Park from 1968 to 1977 before enjoying a glittering career at Liverpool. "But they have been fantastic this year with the brand of football they have played. James Tavernier at right-back is one of their top scorers with double figures. "They have got a really good philosophy under Mark Warburton. But whether that is good enough to compete with Celtic remains to be seen. "They had a game against St Johnstone where they lost 3-1 but then beat Dundee 4-0 in the Scottish Cup. Dundee drew with Celtic just a week ago, so you've got to give them a chance. "It will be interesting to see how they react to playing Celtic, as they are the best team in the Premiership." Celtic are on course to land a fifth consecutive title but manager Ronny Deila has been under scrutiny following a poor show in Europe and a stuttering domestic campaign. "It's an important match for Ronny but I'm sure he won't underestimate it," added Dalglish on the Hampden showdown. "He had his first taste of it last year so he knows what it's about. He understands Celtic. "He's been there for a couple of years. He knows what the club stands for and what this game means. "In an Old Firm game, there is pressure on everybody. "Nobody is going to grab any bonus points by saying, 'We're Rangers, we're just a Championship team, we're not under any pressure'. "Ask the supporters if they are under any pressure. It's the same for Celtic. Celtic are under pressure because they want to win too."